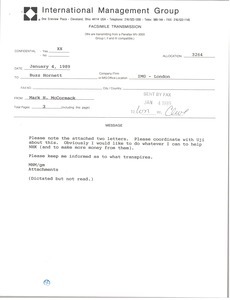 McCormack congratulates Obata on his promotion and looks forwards to continuing a long relationship. 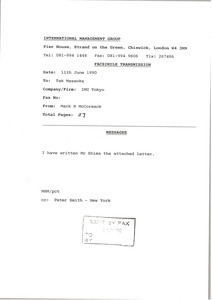 McCormack forwards the letter he wrote to Shima about finding programming that they could co-venture for the international marketplace. 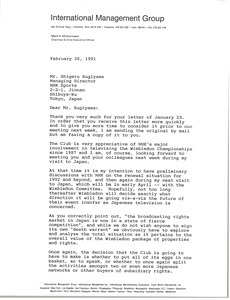 McCormack notes that the Club is appreciate of NHK's major involvement in televising the Wimbledon Championships since 1987 and would like to discuss a renewal situation. 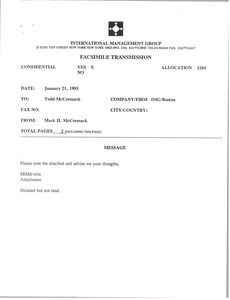 Japan - McCormack asks advice on situation described in fax from Tak Masaoka in Japan. 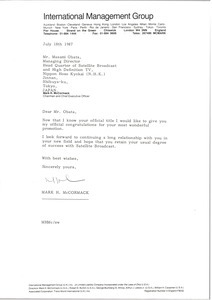 Masaoka advises asking Mr. Kawaguchi of NHK (Japan Broadcasting Corporation) for a new, direct contact regarding the Nobels, since working with Dr. Yano "did not work well."